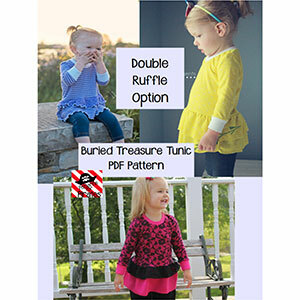 The Buried Treasure Tunic is a comfortable knit top with LOTS of options. Sleeve options include: mid-length and long sleeve, and the added flutter shoulder sleeve. Skirt options include: single ruffle, double ruffle, or banded. All hit just below booty, perfect to pair with a comfy pair of leggings. 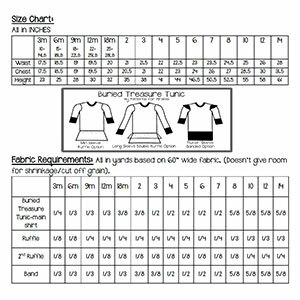 Suggested fabrics are light to medium weight knits such as cotton jersey, cotton lycra or ponte de roma. For the neck and wristbands use a rib knit or a knit with good stretch and recovery such as cotton lycra.